There are only two ways to solve every little problem that arises when travelling solo. One, is to solve it for yourself. Two, is to benefit from the kindness of others. When my bike was crated and sent by air from Sydney to Santiago, the front tyre had to be deflated to allow the bike to be squeezed in to the box, and the tank had to be drained leaving less than a litre of fuel. Riding away from the air freight company’s warehouse, where there was no tyre inflater available, of course, frankly terrified me as I rode almost 5 miles along a busy motorway to the first fuel station. Crawling and wobbling along in second gear consumed the remaining fuel in no time at all. I ran out of fuel, and luck. So I walked to the fuel station only to discover that they did not sell fuel cans. A forecourt assistant kindly dug a plastic bottle out of somewhere. So after a walk back to the bike, that was that problem solved. However, I then discovered that the tyre inflater at the garage was not working. Problem two was solved by a truck driver who stopped and attached an air line hose to his compressor. He even had a gauge to verify the pressure I needed. 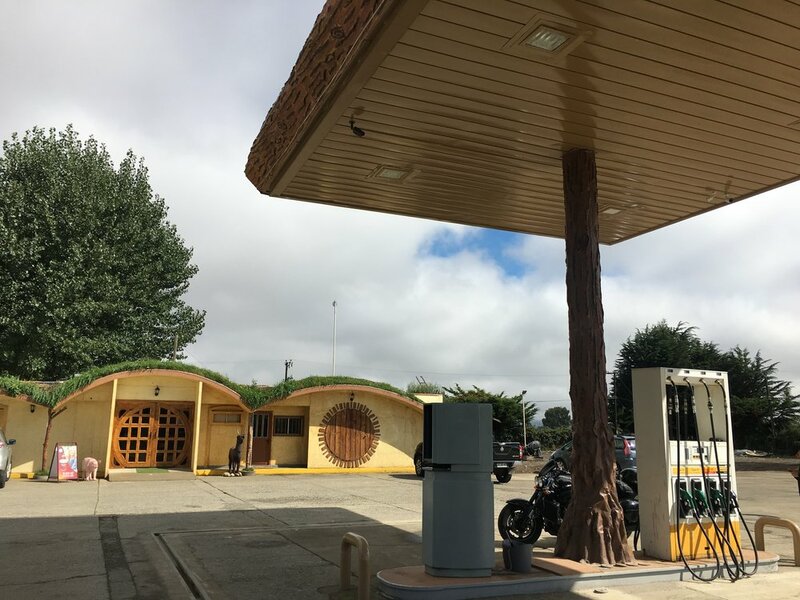 Bespoke styling at this Chilean fuel stop. I settled in to Santiago life for a few days. As I was later to discover throughout South America, it has a typical mix of 16th. and 17th. Century Spanish colonial architecture and culture, together with a vibrant modern buzz. Dictatorships, and a military coup have given way to democracy now, and most people seem content with that. One opinion offered to me was that there was little to choose between the political parties; a view I think could apply to almost every democracy! Illegal graffiti has evolved in to permitted street art. Santiago, Chile. Two types of buildings in which to 'worship'. Santiago, Chile. It was not until I got to Chile that I looked at a map of it separately from the continent. It is very long and thin, ranging from the Atacama desert towards the north, to mountains, fjords and glaciers in the south. I headed south. Five days later, riding 8 to 10 hours per day, I reached my goal. The Perito Moreno glacier. In fact I had swung over the Andes to Argentina by then. This monster of a glacier slides gracefully down the southern tip of the Andes and tumbles in to a cloudy blue lake. As it does so, chunks fall off. A crack like gunfire, followed by rumbling, splashing, gurgling and yelps from tourists like me, tingled my spine. It’s a truly awesome sight and experience; one I had only hoped to see if I was lucky. It transpires that this happens several times a day throughout the summer months. Global warming is not to blame. It has been happening like this for millennia. Summer temperatures are always above freezing, and the lake surface is only 180 metres above sea level. It ends its glacial life with inevitability at this point. The further south I rode in Patagonia, the flatter the landscape became. The trees became shorter, the bushes became spinier, and the grasses became coarser. Llamas are the most common animal, hopping gracefully over the sheep fences to reach tastier grass . I amused myself by noticing the gormless look on their faces. We had many a conversation as I slowed down to ease pass them. Strange things go on inside my helmet when there is no one else to talk to. I don’t expect to see many more armadillos crossing the road on my travels, but there are quite a few in southern Patagonia. Buenos Aires is much larger than Santiago, reflecting the greater prosperity in Argentina, over a longer period. I was drawn in by the passion for football. River Plate and Boca Junior stadiums are both in the middle of town. There are many beautiful buildings, art installations, colourfully painted walls, modern architecture, and places offering Tango lessons. Even in Buenos Aires I saw references to to the fact that Argentina still thinks that Islas Malvinas, or the Falkland Islands, belongs to them. I had seen several road signs to that effect further south. As a UK citizen I have always seen The Falklands Islands as a British Territory, and supported the short war in 1982. However, there is always another point of view in a any dispute, isn’t there? Argentina claims that by default the islands became theirs when they declared independence from Spain in 1816, but that the mighty British Empire pushed Argentinians off the islands in 1833, and settled Britons there. The majority of the present day 2,900 inhabitants wish to remain UK citizens. Imagine for a moment if Argentina occupied the Isle of Wight, and claimed it was theirs. How would Brits feel about that? Argentina has a couple of other disputes which interested me. They claim to have invented the Tango, but so does Uruguay. They also claim that the Rio Plata (River Silver, not the mistranslated River Plate) is the widest in the world at 137 miles / 220 kilometres from Buenos Aires over to Montevideo / Uruguay. However, some think it should be classed as an estuary at this point. Rio Plata. Buenos Aires side. 3 days riding north from Buenos Aires, the temperature and humidity rises as I cross the Tropic of Capricorn again. The border between Argentina and Brazil, as well as being close to the Paraguay border, runs along the Iguazu river. The main road over the river runs right in to a tourist hot spot, and my next goal. The Iguazu Falls. This is an enormous 1.7 mile / 2.7 kilometre run of 275 waterfalls, making it the largest waterfall complex in the world. The drop is 80 metres so that creates a lot of spray and drenches every visitor. No one minds of course because the experience of being there is so sensational. So close to the edge that everyone gets wet. Now I’m in Brazil, and the vegetation is lush.